Markus built this mine to suggest complexity and volume, while fitting into a very finite place on the game grid. 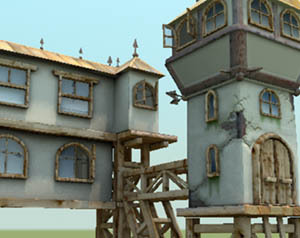 The concept for the rock mine is based on the client's design sketch. 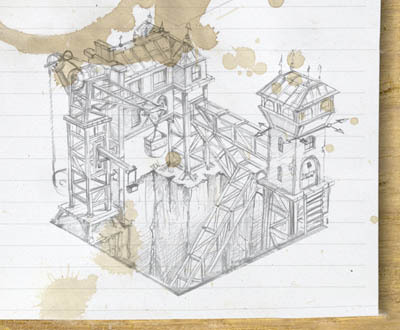 Features built on the scale of isometric games have to balance detail with complexity. Markus modelled and textured the structures to respond to lighting when viewed from the render angle, placing bevels and corners in a way that might not look right close-up, but suggest the detail natural to each beam and building when rendered at game resolution and POV. The final game graphic was rendered using Mental Ray, primarily for the lighting features, including Global Illumination.